Ohio University Quidditch Club at the US Quidditch Cup last year in Round Rock, TX. Photo Courtesy of Savannah Heller. A National Tournament appearance is the goal of most teams, and the Ohio University Quidditch Club has reached that milestone. The team will travel to Round Rock, TX for the second year in a row to play in the US Quidditch Cup on April 13-14. But how is the fictional sport from the Harry Potter series played in real life? 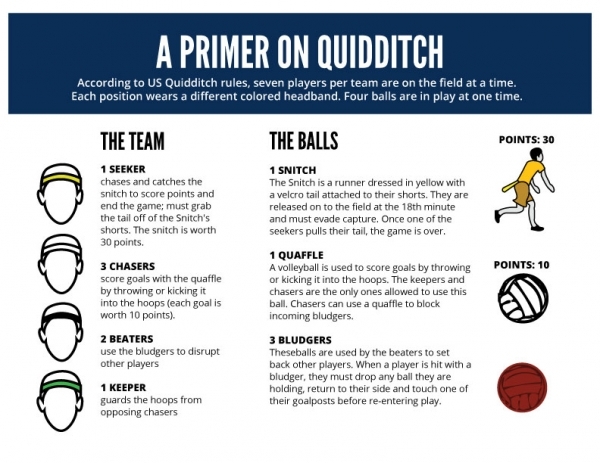 The sport is governed by US Quidditch, also creators of the rulebook. Two teams go head-to-head with seven players on the field, all holding PVC pipe between their legs as a broom. The game is played on a field 36 yards wide and 66 yards long with three hoops as goals. The three hoops are different heights: three, 4.5 and six-feet tall. There are four different positions for the players on the field. The players consist of a keeper, two beaters, three chasers, and a single seeker. Each position wears a different colored headband to identify the positions. The keeper protects the hoops to keep the other team from scoring. The two beaters are defenders who try to disrupt the offense by throwing bludgers, a dodgeball, at them. The chasers try to score by getting the quaffle, a volleyball, into the hoops. If a chaser is hit by a bludger, they have to drop whatever they are holding and run back to one of their hoops before re-entering play. The seeker does not touch the field until 18 minutes into the game when the snitch is put into play. There are only two ways to score. The first is worth 10 points where a team’s chaser is able to throw the quaffle through any hoop. The second way to score is by capturing the snitch, a tennis ball that is attached to a runner wearing all yellow, That is worth 30 points and ends the game. After 18 minutes of play, the snitch enters the game. When either team’s seeker grabs the ball, the game is finished. If the teams are tied after the snitch catch, overtime is needed. The overtime period lasts five minutes or until the snitch is caught, which enters the game after 30 seconds. If the first overtime ends in a tie, there is a sudden-death second overtime period played. The second overtime ends when the first team scores a goal or captures the snitch. Members of Quidditch Club after their Home Tournament. Photo Courtesy of Savannah Heller. Players prepare to begin a match. Photo Courtesy of Savannah Heller. Colton Wheeler leads the Offense. Photo Courtesy of Savannah Heller. Colton Wheeler surveys the field as the keeper. Photo Courtesy of Savannah Heller. The Ohio University Quidditch Club has made a name for themselves with their success, ranked 12th in the nation for college quidditch teams according to US Quidditch. They make their way to the national tournament with an 18-3 record after winning only eight games two years ago. “The difference from then to now is astounding and that really has just been the commitment of everybody that has been involved and how much time everyone puts in,” team member Colton Wheeler said.